Living as close to a nature preserve at M.E. DePalma Park means Monarch Butterflies float past my windows frequently. 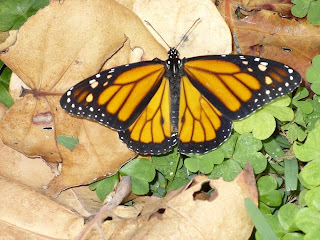 I enjoy having them around, but it does mean that the food that I grow for them, Mexican Milkweed, is almost always eaten down to sticks. seeds will ripen enough to actually be able to replant. I took a step back and looked at what was happening and realized that these things should be simple to propagate. It turns out that I was absolutely correct. Why wait for seeds, just wait for leaves. 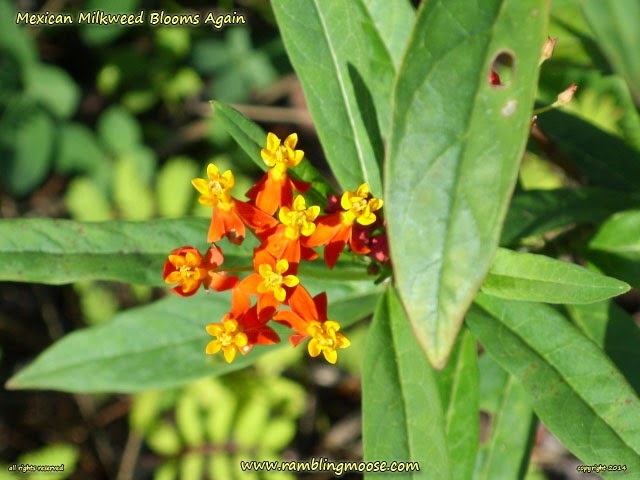 milkweed, leave an egg or three on it, and move on. This usually ends up where one sad little plant has three to six caterpillars fighting for food. It also means that few live long enough to be butterflies. My own attitude toward gardening is a pragmatic one. If I have a plant that I like, I will try to propagate it. If it propagates successfully, I end up having a lot of it. For example, I am currently using "Screw Palms" or Dracenea Cane plants as ground cover because I have so much of it. Take a cutting, drive it into semi moist soil to about the depth of your hand, and it almost always roots. ... In My Climate. Your mileage may vary. I have a long line of plant pots on a drip feed irrigation line. 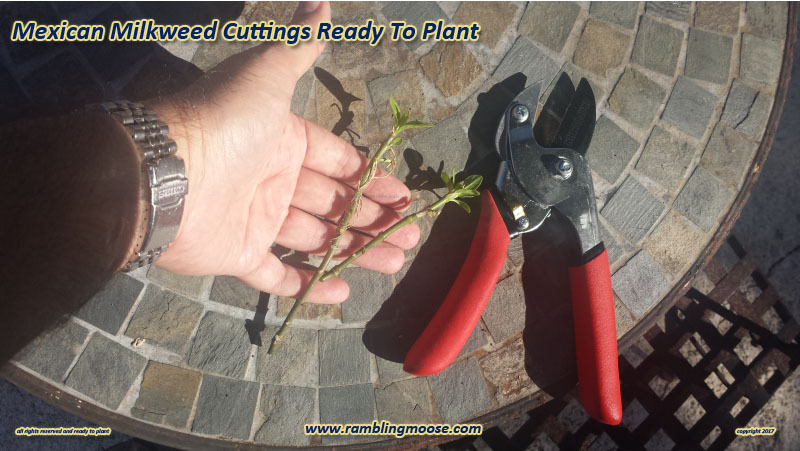 This is specifically designed to allow me to grow more plants to take more cuttings to make the yard have more of the same plants. It was also designed to be within the local watering regulations of a drip feed line - each head should be no more than one gallon per hour for example. So applying all that noise and technology, here is how I propagated my Mexican Milkweed. I am seeing about an 80 to 90 percent success rate. Step 1: When the Milkweed has been eaten down to sticks, check for plant remnants where there is actually some leaf growth on it. This will be your mother plant. See above. inches or 10 cm would be perfect. I have had success with a cutting that had two leaf nodes on it. About 2 inches or 5 cm. I did not use rooting hormone, but that will only improve your success if you dip the root side of the cutting in the powder. 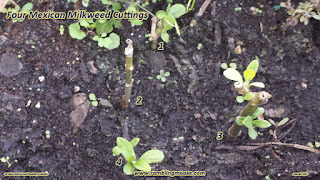 Step 3: Push the cutting down into the soil to allow the existing last leaf node or two to show above ground level. Step 4: Make sure that the soil is kept moist and that normal growing conditions continue. Growth should be fast and visible within a week or even a couple days. Step 5: When the cuttings begin to show some signs of vigor and begin to put forth new limbs, consider replanting in the ground or another pot. That's about it. I have at least 20 cuttings growing now, and will be starting more when the mother plant puts out some more growth. The result would be like this flower head if ever the Monarchs let it get that far. 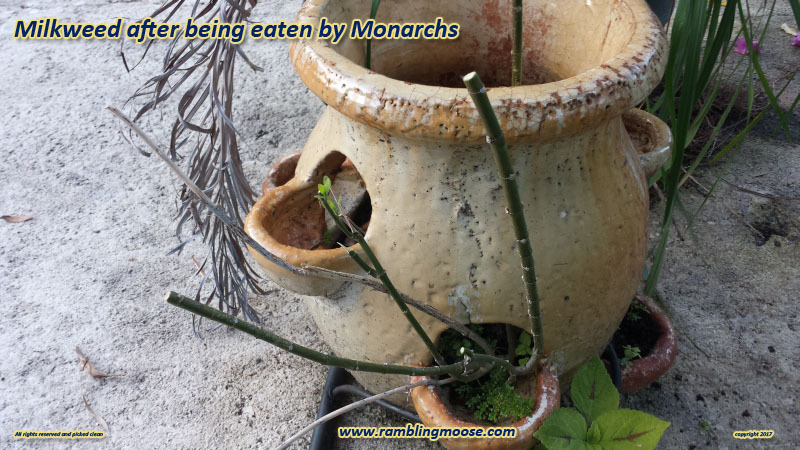 Usually this is where I spot the caterpillars doing their thing and turning the plant into Crudite.